This was indeed a sad day two years ago. I’m happy to see officer Tony Radulescu has not been forgotten for his exemplary services throughout his career. May he rest in peace. I was wondering why isn’t there a memorial headstone or something at this location??? I think of him everytime I pass this area and think of what was done and a life lost. I would think that if program was set up for a nice place someplace along that roadway (But of course) oft the roadway some type of plaque or status could be placed so that the general public can take notice of a tragedy that didn’t have to happen. Rip Police office Radulesu and you were taken away to soon. At the time, I recall there were concerns about safety (e.g. having people stop and pay respects on the side of a busy highway). I would love to see this stretch of highway renamed the Tony Radulescu Memorial highway. There is a memorial headstone at the Washington State Patrol building in Bremerton off Werner rd. and it’s outside and publicly viewable I’m pretty sure. There is a beautiful memorial that is accessible to the public outside the WSP building off of Werner. 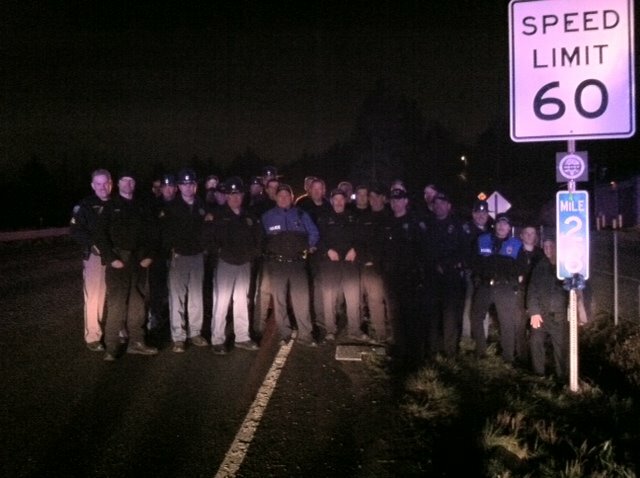 Thank you to these officers for remembering Trooper Tony!